St. Cecelia by Paul Delaroache ca. 1836. 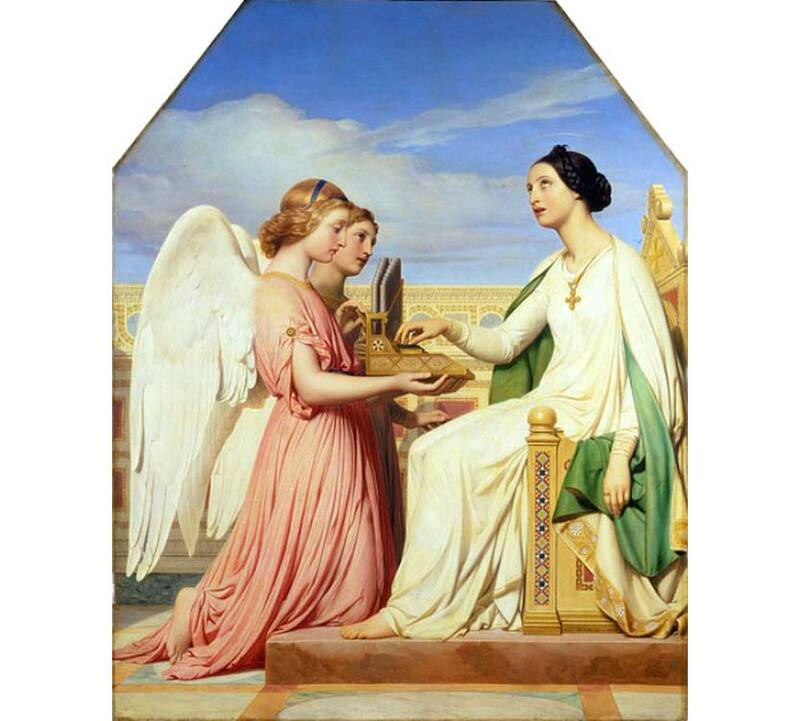 Little historical information exists about Cecelia, other than that the Romans martyred her in Sicily in 176 A.D. She has become the patron saint of music and is depicted here playing a miniature Renaissance organ. Ester Mui is not well known, but this is a lovely worship song from a talented singer-songwriter. Heavenly Lord, I pray that this day, you will continue to bless me, that I may be a blessing to others. Keep me strong that I may help the weak. Keep me uplifted that I may have words of encouragement for others. I pray for those that are lost and can’t find their way. I pray for those that are misjudged and misunderstood. I pray for those who don’t know you intimately. I pray that others will find your strength, so that they can love and help one another. I pray for those that don’t believe, that they may find you. 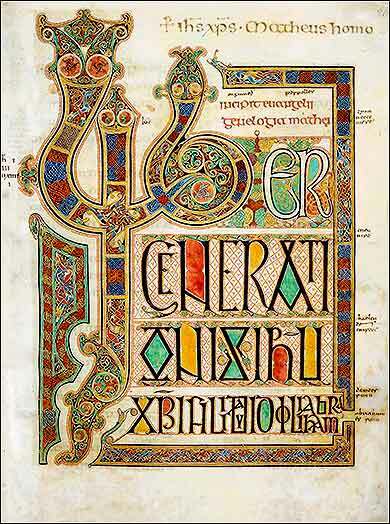 Liber generationis Iesu Christi, “The book of the generation of Jesus Christ”, the first page of the Gospel of Matthew in the Lindisfarne Gospel, illuminated in a monastery off the coast of Scotland around 700 A.D. The first three letters, “Lib”, are highly stylized, and Greek letters are mixed into this pre-Vulgate translation. and thou shalt be beloved above the glory of men. and he is honoured by the humble. and in many of his works be not curious. We all want recognition. But we have to choose: Do we want recognition from other people, or do we want recognition from God? Do we want a brief moment of higher status in the eyes of others people, or do we want to go to heaven? Christ says nothing difficult to understand, here: the message is clear and simple. Go ahead, read it again. The rub, as usual, comes not from any difficulty in understanding exactly what we should do, but in dealing with our instincts to the contrary. We want to be recognized as a “good person”. Everybody instinctively wants prestige, recognition, fame; life on earth is a rat race, and we at least want to climb a bit higher in the rat pile for our $1000 or whatever. It's a freebie; once we are giving the money anyway, why not be recognized for it? The direct answer is simple: Jesus told us not to. And we know that he never speaks to hurt us; he seeks to teach us for our own good. Even when his teachings seem difficult, he knows much that we do not and seeks to share his knowledge with us. He is like a parent telling a small child not to stick his finger in a light socket; he sees clearly something we cannot. We do not obey him like slaves, but like students with absolute trust in their teacher's knowledge and motives. And even the “why” is not hard to see. To gain salvation, we must be crucified with Christ and be born anew, living in Christ, which means, living both in and for the glory of God. We betray our salvation when we seek glory for ourselves. We celebrate our salvation and our love for Christ when we give to the sole glory of God. Our giving is not forgotten, for Christ promises us that we will “lay up our treasure in heaven” in verses 19-21. When Christ tells us that we will get our reward from our Father in heaven, we are not anxious about receiving it. We have a deposit in the safest bank. Thieves cannot steal it and it cannot be corrupted or destroyed; it is absolutely assured.